In June 2014, an archaeological excavation was conducted along the western edge of a paved Byzantine street ascending from the western slopes of the City of David hill to the Davidson Archeological Park (Permit No. A-7130; map ref. 222327–32/631338–61), prior to preparing the site for visitors. The excavation, in the Jerusalem Walls National Park, undertaken on behalf of the Israel Antiquities Authority and at the instigation of the Elad Association, was directed by J. Uziel and M. Hagbi, with the assistance of V. Essman and Y. Shmidov (surveying and drafting), A. Peretz (field photography), G. Berkowitz and A. Ajami (area supervision), N. Natanel and B. Cohen (safety), A Koren (engineering supervision), J. Sheffer (conservation engineering), I. Novoselesky (wet sieving) and Y. Gorin-Rosen (glass). 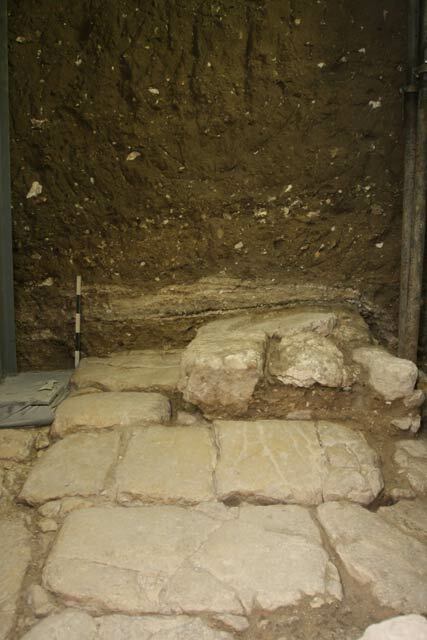 The excavation exposed the western side of a flagstone-paved street, which led from the Byzantine church at Siloam in the south, to the Temple Mount area in the north. A rounded building, and a cistern with an access-shaft from street level were revealed west of the street (length of excavated area c. 10 m, width 4 m). Above the paved surface were layers of collapse and beaten soil, which rendered the paved surface unusable, and were turned into a dirt road. Pottery sherds from a range of periods were mixed with the accumulated soil. Refuse pits were dug into this layer, probably during the Early Islamic period. The latest material in the excavation—presumably intrusive material from a previous excavation, or from a narrow trench in the western part of the area—dates to the late nineteenth–early twentieth century CE. Modern pottery was found while sifting the soil that was removed from the trench, which may have been part of an earlier excavation (below). Part of the same street, which was excavated in the past (Crowfoot and Fitzgerald 1929:37–58), stretches along the western slope of the City of David hill, ascends north, and crosses the Tyropoeon Valley to its west bank, where it joins yet another section that was recently uncovered in the Giv‘ati Parking Lot excavations (Ben-Ami and Tchekhnovets 2010). The current excavation exposed one more section of this street, also on the west bank of the Tyropoeon valley. The Paved Street (2.5 × 10.0 m; Fig. 1). The size of the flagstones is not uniform (0.35 × 0.35–0.4 × 1.0 m). Unlike the section that was uncovered in the Giv‘ati Parking Lot, no sidewalk or any curbstones were found along the street here. A stone collapse, sloping toward the west, was exposed in the southeastern part of the street (Fig. 2). Between the fallen stones and the western edge of the street was a soil fill, which was mixed with fragments of pottery, glass, bones, charcoal and even a charred wool fabric. The fill reached the top of the collapse, and was visible along the entire length of the excavation area. Above the fill were two layers of tightly packed white calcareous material, probably subsequent phases of the road along the top of the City of David hill, and above them yet another collapse, south of the round building (below). The architectural elements that were exposed along the western edge of the street are described below, from north to south. The Cistern (Fig. 3). 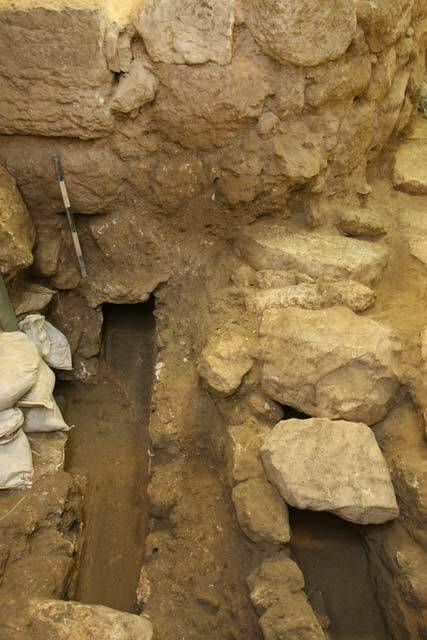 An elongated vaulted cistern (1.5 × 3.5 m, height 3.5 m) was exposed beside the street, in the northern part of the excavation. Its upper part protruded c. 0.4 m above street level. The cistern was plastered inside and out with a light-pink plaster mixed with grog. On the outside, the plaster covered the top of the cistern and its eastern wall, and reached just over the edge of the flagstones paving the street (Fig. 4), apparently to prevent surface runoff water from seeping into the installation. A low step led from street level to the top of the cistern at its north, and to a round access shaft (depth c. 1.1 m, max. diam. 0.6 m), with square external outline (width c. 1 m). The width of the cistern is not known, since it extends beyond the western boundary of the excavation. The exposed width is c. 1.1 m. The layers of beaten earth and chalk above the street abutted the plastered wall of the cistern. Ashlars filled the cistern from the bottom, to the entrance of the access shaft; they were arranged in a slope from the access shaft, in a north–south direction. Underneath the ashlars, on the floor of the cistern, was a layer of pottery vessels, consisting mainly of jugs, with several jars and small bowls, all dating to the Late Byzantine period. The Rounded Building. A curved wall, built along the edge of the street, was exposed in the southern part of the excavation area. The wall abutted the side of the cistern on the north. West and south of the wall was an ashlar collapse, mixed with fragments of roof tiles, window panes and charcoal—this last probably the remains of wooden beams. Below the collapse was a beaten chalk floor, on which glass vessels were discovered. Preliminary examination dates the vessels to the late sixth–early seventh centuries CE. The layers of soil and beaten chalk above the street abutted the wall of the building. The excavation was extended to the west in order to uncover the wall farther, but it turned out to have been severed by a later disturbance. The Drainage System (Fig. 5). Three drainage channels built of fieldstones, lined with plaster, and covered with partially worked stone slabs, were exposed. The channels probably drained buildings along the western side of the street. Refuse Pits. Refuse pits (depth 1.5–2.0 m) were dug into the soil that accumulated over the remains. At the bottom of the pits was a layer of small stones and accumulated deposits of soil, mixed with pottery sherds, stone objects, glass, bones, charcoal and architectural elements. The finds from the refuse pits date from the Iron Age and until the Early Islamic period, which is when they were apparently in use. Excavation Trench. After the rounded building was exposed, the excavation was extended west, to uncover the western part of the structure. A fill of small stones which cut the wall of the building, the plaster floor, the drainage channel and the fills above the building, was found there. Modern pottery was discovered in the fill during dry sieving. This was probably a trench that had been excavated by a previous expedition to the City of David hill. Slightly to the south of the current excavation area, Warren excavated a shaft (Warren 1884: Pl. V, Shaft 26), but it cannot be ascertained if this is the shaft he excavated, or part of another excavation. 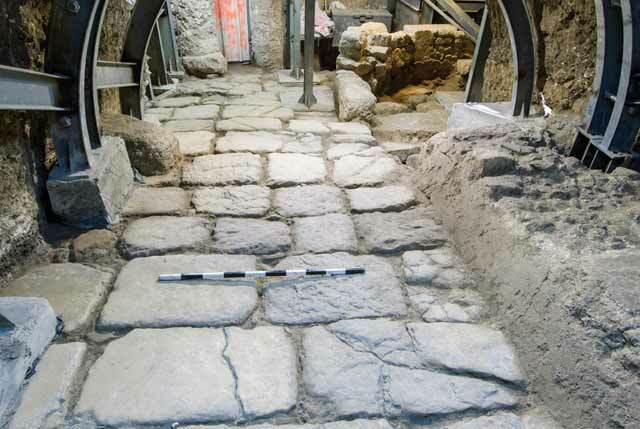 The excavation augments the information derived from previous excavations along the Byzantine-period street (Ben-Ami and Tchekhanovets 2008), which revealed that the street was paved with rectangular flagstones in the sixth century CE, and flanked by sidewalks (overall width c. 6 m). Use-worn flagstones were found. The cistern joins the residential and public buildings that were uncovered along the street in earlier excavations. A hoard of coins from the reign of Emperor Heraclius was found in the public building, and dates its destruction to 614 CE (Ben-Ami, Tchekhnovets and Bijovsky 2010). The stone collapse in the southern part of the street was probably associated with this destruction. The flagstones under the collapse were crushed. It seems that after the paved street had gone out of use, several dirt roads were constructed along the same route in the Early Islamic period, and the area underwent substantial transformation, which is manifest in the refuse pits that were dug there. Ben-Ami D. and Tchekhanovets Y. 2008. The contribution of the Excavations in the Givati Parking Lot to the Study of the History of the Ancient Settlement in the City of David. City of David Studies of Ancient Jerusalem 3:101–102 (Hebrew). Ben-Ami D. and Tchekhanovets Y. 2010. Jerusalem, Givati Parking Lot. HA-ESI 122. Ben-Ami D., Tchekhanovets Y. and Bijovsky G. 2010. New Archaeological and Numismatic Evidence for the Persian Destruction of Jerusalem in 614 CE. IEJ 60:204–221. Crowfoot J.W. and Fitzgerald G.M. 1929. Excavations in the Tyropoeion Valley, Jerusalem 1927 (Palestine Exploration Fund Annual 5). London. Warren C. 1884. Plans, Elevations, Sections, &c., Shewing the Results of the Excavations at Jerusalem, 1867–70. London. 1. The paved street, looking south. 2. 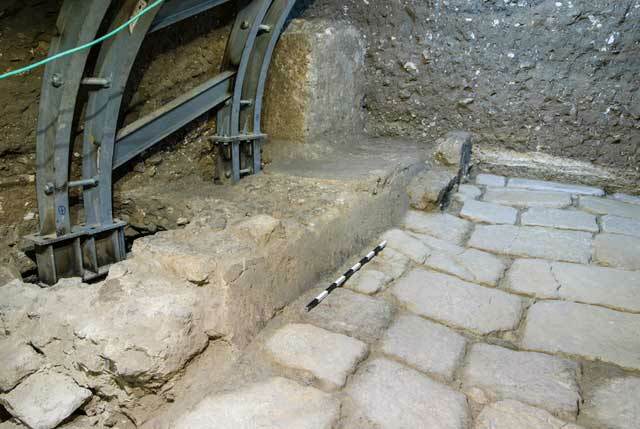 The northern section: the collapse and stratification showing on the surface of the street. 3. The cistern, looking north. 4. The cistern and the access shaft, a layer of plaster abuts the stones of the street, looking northwest. 5. The drainage channels below the wall of the curved building, looking north.